Hester joined us in November 2010. 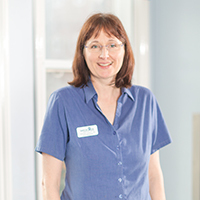 She returned to work with us after previously training and qualifying as a veterinary nurse at Barton Lodge Veterinary Centre in 1993. Since that time Hester continued to work part-time in a veterinary practice in London where she gained much experience. Hester uses her broad knowledge and skills whilst working in the administration team and also sometimes on reception where she enjoys meeting all the clients.